All In the Schoenbauer Family - Schoenbauer Furniture Service, Inc.
About Schoenbauer Furniture Service, Inc.
Four generations of the Schoenbauer family have built a company known coast to coast for superior workmanship and top quality customer service for the Repair, Restoration, Refinishing of furniture and art objects of all types, from fine antiques and family heirlooms to contemporary pieces and executive office furniture. When your furniture sends you an SOS, it’s time to call SFS — Schoenbauer Furniture Service of Charlotte Hall. That’s what people from all around the region do and have been doing so since 1990. As the company boasts, “We serve over 450 zip codes.” Depending on what needs to be done, they’ll either pick up your furniture or restore or repair in your home. They’ll also fix the family treasure that fell into a mess of shards when a visiting dog tore through your foyer or when a tornado twisted its way through Charles and Calvert counties. Some of the company’s business has involved repairing furniture damaged by moving companies, too. Schoenbauer family members pose outside the business in Charlotte Hall. From left are Mikey Schoenbauer, Mike Schoenbauer, Bill Schoenbauer, Jon DePompa and Katie Schoenbauer Morgan. With so many military and government families in the area serving around the globe, office manager Katie Schoenbauer Morgan (and the fifth generation of the Schoenbauer family to work in the business), says work the company has done can be found almost everywhere. In this family-oriented operation are Katie, who’s been working for the company for 13 years, and her dad, Bill, who is the fourth generation to run the company. Then, there’s his younger brother, Mike, a 30-year employee, who is the finishing and production manager. Jon DePompa, a brother-in-law, is one of the lead road technicians who travels for in-home repairs. Mikey Schoenbauer, Morgan’s cousin, who’s entering his senior year of high school, is an apprentice during the summer. In 2007, the company expanded when it bought the highly regarded Georgetown Refinishing & Antique Restoration which had been in business for decades. Known for repairing and restoring antiques and other home furnishings, the Schoenbauers brought the business to Charlotte Hall. Schoenbauer does more than small projects. The folks at Baltimore’s Enoch Pratt Free Library sent some 250 desks, chairs, sideboards, some sofas and other furniture from the main branch to Schoenbauer as part of a massive, historic restoration. It’s the first full renovation for the 290,000-square-foot building that was erected in the early 1930s. 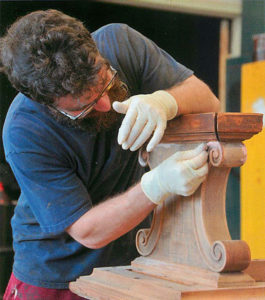 Most of the furniture is the original wood, and Schoenbauer is restoring the finish. “It’s not really badly damaged,” Morgan says. “We don’t have to fabricate to match and replace the original. It’s walnut veneer on tables.” The work is scheduled to be completed, in phases, by February 2019, with some small pieces finished in September, a few in November, and the rest three months later. Schoenbauer Furniture Service also is working on a project for the National Institutes of Health in Bethesda, where the company is doing upholstery on 100 pieces for the Edmond Safra Family Lodge. The ADA-accessible lodge is a home-like facility wi1h guest rooms offering overnight accommodations for families and loved ones of adult patients who are receiving care at NIH. She says the family takes pride in its work. “We feel honored to be part of their history,” she says, talking about each item that has been entrusted to the Schoenbauer company. Schoenbauer Furniture Service is at 30507 Potomac Way in Charlotte Hall. For more information, call 800-955-7603 or go to schoenbauer.com. 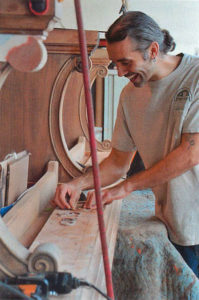 Tim Supp works on antique restoration. 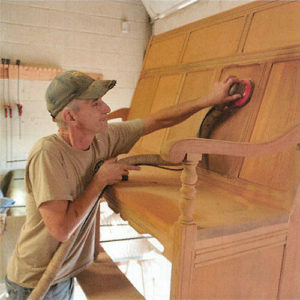 Rob Barnhill restores a larger piece of furniture. 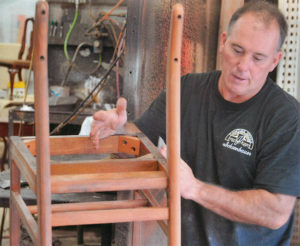 Mike Schoenbauer inspects a chair that is being refinished. Kore Borno is at work in the company’s warehouse in Charlotte Hall. 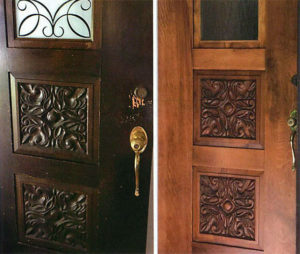 Before and after photos of a refinished door. Photo by Schoenbauer.